Drafts from Around the World: 9/25: Good morning Prague! 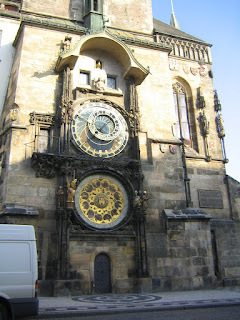 Started off at the old Astronomical Clock in the Old Town Square. Besides its unique and creative use of the word "clock", there is also a mechanical skeleton who wakes up every hour to pull on the string that rings the bell, a live bugler plays from the top of the tower, and when it's all done the rooster crows what sounds like a trumpet got flattened by a truck. It's all very amusing! 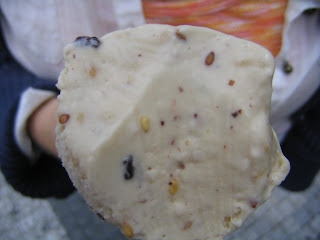 After a pitstop for what I believe they are calling Turkish Ice Cream (with sesame seeds!! ), we signed up for a 4-hour walking tour, which was just right. 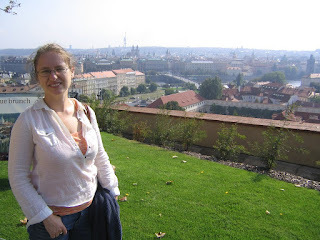 Walked all around the grounds of the Prague Castle and St. Vitus Cathedral -- both which will be closed tomorrow because the pope is coming -- everyone up there was in a mad frenzy!! Continued the tour and passed what appears to be a monument to the never-there-when-you-need-it toilet (or so it seemed), and another hot air balloon -- this time it was tied to the Vitava River. What is it with Eastern Europeans launching hot air balloons tied to riverbanks? 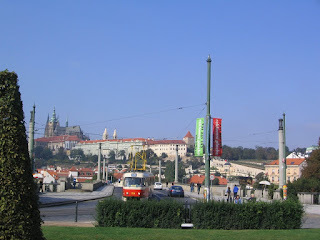 Re-entered the old town by crossing the Charles Bridge, which was built in 1342 and is presently (still?) under renovation. This is a great place to view the touristicus in this prime environs. Photographs are being snapped, caricatures are being sketched, statues are being rubbed for luck, overpriced golems are being purchased, pockets are being picked (literally and metaphorically), defenestrations are being reenacted. Mostly kidding the defenestration reenactment (although maybe now somebody will take the idea). 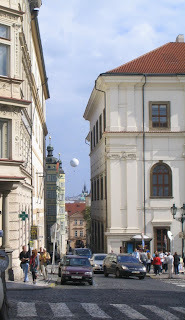 Our walking tour guide defined defenestration as the act of throwing somebody out a window in Prague -- this is an important part of Czech history. John of Nepomuk was thrown off the (then brand new) Charles Bridge in the 14th century for refusing to tell the King the confessed secrets of the Queen. Czech Protestant nobles threw two Austrian Catholic officials out of a window in 1618, starting the 30-year war. And if we're not careful, the timing is ripe for this very thing to happen again to some unlucky tourist! The tour ended in the Jewish Quarter, the former ghetto and then Nazi-imposed ghetto and then razed/newest construction in town. These exhibits will also be closed tomorrow -- not in deference to the visiting Pope -- but due to Shabbat. Now this part of town is part luxury shopping (think Swarovski, Prada, Omega) and part Jewish museums and synagogues. There are synagogues that appear to be working and those that are permanent museums. 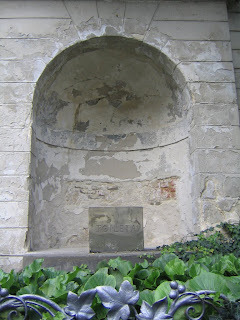 The Pinkas synagogue is particularly moving - listed on the walls are the names of 77,297 Czech Jews perished in WWII. Apparently, in 1968 they discovered a water leak in the basement that was threatening the foundation of this synagogue. While attempting to fortify it, the Soviet say this as their opportunity to shutdown the exhibit and paint over the walls, which is how it stayed until 1990. During the 20th century, the Czech Jews really went out of the frying pan and into the fire, so to speak. 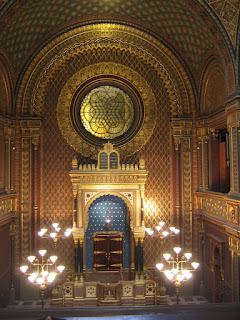 The 200-year-old Spanish synagogue is also quite nice, with its beautiful Moorish (Sephardic?) design. It's moving to look at, even if you are exhausted from reading all of the exhibits. We continued this jam-packed day with a Marionette version of Mozart's Don Giovanni opera. 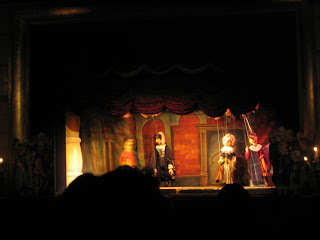 The opera seemed to be prerecorded and, as a result, the "live" marionettes could sometimes do comedy playing off the immortal "static" opera. There was a fair amount of implied debauchery and violence -- enough to be very funny but not over the top. The children in the audience seemed to enjoy it very much. They continuously kept breaking through the fourth wall, at one point a golem broke through the set, and then towards the end a puppetmaster got tired and came on stage to speed things up. All in all, it was a great show.